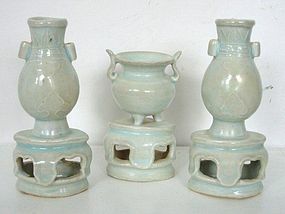 Lovely miniature qingbai altar set: a censer and two vases. China, Yuan Dynasty (1279-1368). H. censer 10,5 cm, vases 14 cm. Condition: excellent.